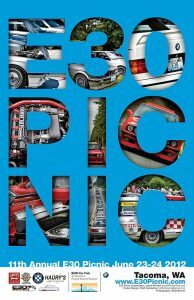 The Puget Sound Chapter’s E30 Picnic is the largest yearly gathering of E30s in the world. 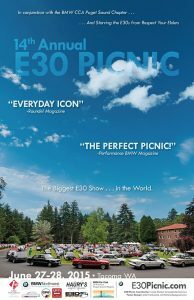 The most recent 2018 E30 picnic saw over 280 E30s in attendance, coming from ten states and two Canadian provinces. However, the event did not start out so large. 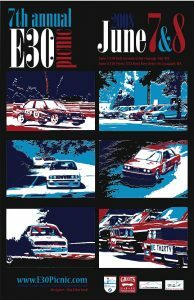 Here is a brief history of the E30 Picnic. 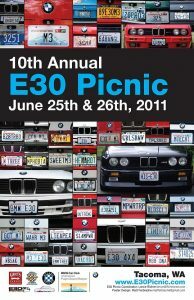 The E30 Picnic did start as a simple picnic, in 2002, at Newcastle Beach in Bellevue, WA. 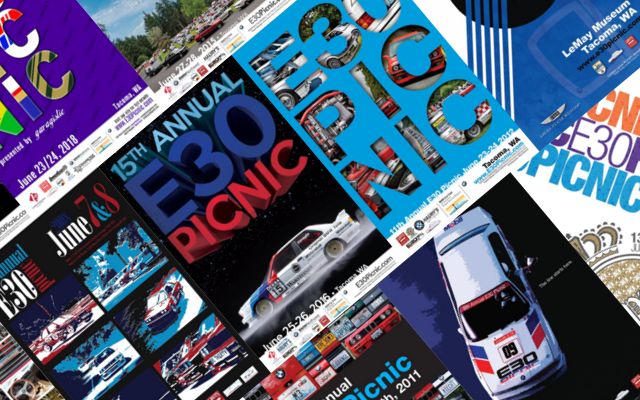 The event was launched by Lance Richert after watching more informal gatherings of E30s take place at various parks in Seattle. To make lunch simple at the first Picnic, we said bring five bucks and we’ll order up six-foot Subway sandwiches. We thought we might see two dozen E30s show up the first year but in reality, saw 54 E30s attend and around 110 people. Year two saw 91 E30s attend plus one BMW M1 which was allowed to park in the corner. 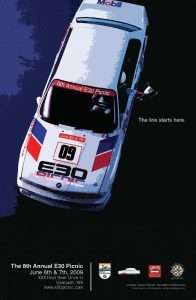 The M1 was Dean Schindell’s whose E30 M3 was in pieces at the time going through an extensive renovation. Year three saw 112 E30s show up and we were feeding 250 people with six-foot Subway sandwiches. With only 90-something parking spots allotted to the Picnic by the Bellevue Parks Department, we overran the facility and went on the hunt for a bigger location. We also weren’t organized enough to remember who was the furthest traveled during the Newcastle Beach E30 Picnic era. 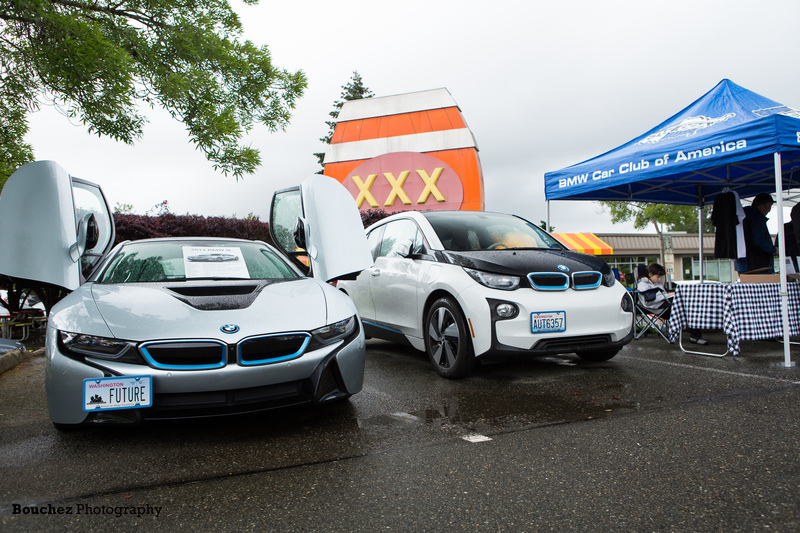 With the E30 Picnic in need of more space and someone to provide the food, we hooked up with the Triple-X Drive-In in Issaquah who held weekly Sunday car shows. 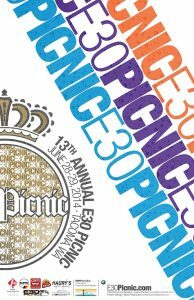 The E30 Picnic continued to grow with 2005 seeing 105, 2006 saw 165, 2007 drew 169, 2008 was 180, and 2009 a whopping 243! The 243 was an estimate as we had no exact way to count E30s at the Triple-X. But there were a lot. 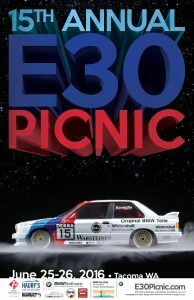 The problem was other enthusiasts were coming to see the E30 Picnic, which led to the Triple-X being overrun with cars. The Issaquah Police were called and it was time to find another new home for the E30 Picnic. Highlights at the Triple-X included one year where we invited some Mercedes 190 16 valves to attend. These were the Mercedes homologation equivalent to the E30 M3. We also had the Issaquah Fire Department out with their ladder truck and that helped Curtis Creager get a great aerial photo of the show which we commemorated in a poster. We also saw more and more people making long drives from outside the Pacific Northwest. 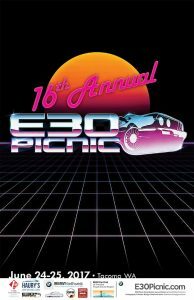 In 2010 we landed the E30 Picnic at the LeMay Marymount Museum. Not to be confused with the new LeMay Museum in Tacoma. LeMay Marymount was the original museum location for the large LeMay collection of cars. 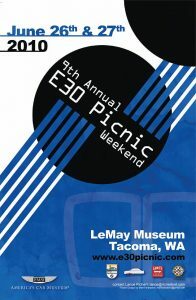 Blessed with irrigated grass fields, LeMay Marymount was a perfect location suitable to the E30 Picnic. A cozy green lawn circled by walls of green evergreen trees and brick buildings from the old monastery. Also located further south in Spanaway, it was a bit closer for the large caravans of E30s now routinely coming from Oregon and California. 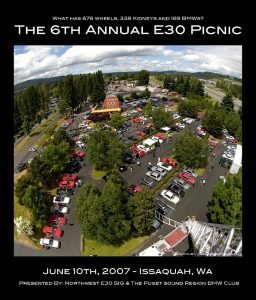 And being in Spanaway, a little further out on the fringes as the E30 Picnic still tries at heart to be a private party rather than a public car show. 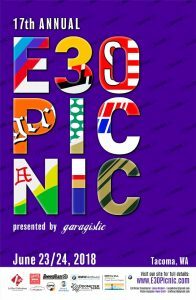 In 2018 we saw more people flying into the Picnic who didn’t want to drive, and Garagistic was brought on as a Presenting Sponsor. We don’t have many awards at the E30 Picnic. But we do bestow special recognition to the person who drove the furthest to the E30 Picnic in their E30. In the early years, coming from somewhere along the West Coast would secure the Furthest Traveled award. Now, you pretty much need to be driving an E30 from the far East Coast to snag the Furthest Traveled award! 2006 – Josh Anderson, Bend, OR.